CBS already has a summertime full of disparate people sequestered under the same roof. The 15th edition of Big Brother launches on Wednesday, June 26th. The new 13-part series Under the Dome, adapted from Stephen King’s umpteenth novel, has no $500,00 cash prize awaiting one of its inhabitants. Nor did any of the residents of little Chester’s Mill know what they were getting into. Still, the principle’s roughly the same. How well or poorly will they co-exist after being cut off from the rest of the world? Who knows more than he or she is letting on? What alliances will form? How it all turns out -- and whether the book is closely followed -- look to be well worth your investment. CBS has made only the first hour available for review, but it makes for an impressive start Monday night. Under the Dome, whose co-executive producers include King and Steven Spielberg, seems destined to be the crown jewel among summertime diversions from the Big Four broadcast networks. It looks neither cheap nor too deep. But as popcorn entertainment, there’s some nourishment as well. The cast is bereft of any marquee names. But it’s going to be a very big summer for a familiar face to Breaking Bad fans. Dean Norris struts through Under the Dome as “Big Jim” Rennie, a throw-his-weight-around city councilman who perhaps knows something about why and how an invisible force field has suddenly enveloped Chester’s Mill. And while this series runs its course, Norris also will be very visible as the pivotal Hank Schrader on Breaking Bad, which returns to AMC on Aug. 11th for its final eight episodes. Under the Dome begins with the rather mysterious Dale “Barbie” Barbara (Mike Vogel) tossing a male corpse into the grave he’s just dug. By episode’s end, viewers will know the identity of the deceased but not the circumstances of his death. Barbie later is out in a pasture when a cow is split in half length-wise by a searing something-or-other that burns a line in the ground marking the force field. As in The Truman Show, the invisible bubble also occupies air space. A prop plane is sent crashing into bits and pieces after flying into it. For good measure, the producers throw in an accompanying severed leg. Townies gradually learn what’s befallen them. They include a new newspaper editor named Julia Shumway (Rachelle Lefevre), who first runs into a middle-aged crank with an aversion to print product. “I get my news online, sweetheart, like everybody else,” she says. That’s cold -- and marks only the beginning of Shumway’s problems. The aforementioned “Big Jim” has a twisted, knife-wielding son known as Junior (Alexander Koch), who tells the old man, “I’m the only one who understands what’s really going on here.” His would-be girlfriend, Angie McAlister (Britt Robertson), is a hospital candy striper who knows Junior’s dark sides all too well -- and runs afoul of them. 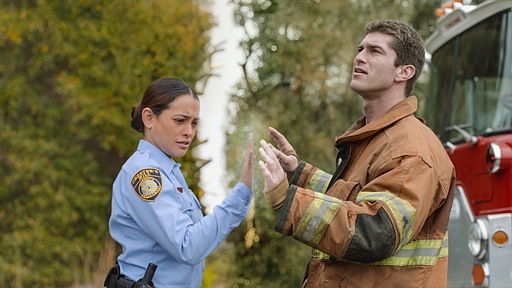 Under the Dome parlays solid special effects and an intriguing storyline, giving CBS’ a bracing breeze of fresh air during a summer season that previously has been a playground for Big Brother and “procedural” crime series reruns. Cable networks use this time of year very efficiently, saving many of their most popular and/or acclaimed dramas for hot weather runs. Now CBS looks as though it also might have both a player and a water cooler talker. The water cooler mostly being the internet these days. But the Los Angeles Times recently reported that those words -- from Obama’s assurances to victims of Hurricane Sandy -- have been cut from the final on-air version of Under the Dome. It was deemed “inappropriate” to mix and match a real-life tragedy with a fictional one. Maybe the president will be watching anyway. He likely could use a quality summertime escape.